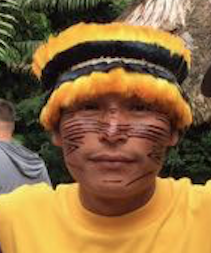 The mission of Pachamama Alliance is to empower indigenous people of the Amazon rainforest to preserve their lands and culture and, using insights gained from that work, to educate and inspire individuals everywhere to change the dream of the North--to bring forth a thriving, just and sustainable world. The journey into the Amazon at the invitation of these people really began the minute Loretta and I decided to go. In retrospect the time of preparation was just as significant as the journey itself. "This journey is meant to be about LOVE not FEAR. But if I am honest with myself, I am pushing aside real fears. I'm afraid of not knowing how to communicate when I do not know the language. To give myself a little credit, I am trying to release all expectation"
Just in case, I install Google Translate Spanish Version on my iPhone. Before we left California, I lost my keys, our hotel reservation was mixed up, I got us lost in the hotel parking lot on the way to the airport it was as if dream time was reaching out to me and I hadn't even boarded the airplane yet. A jungian once told me: "when the true self emerges... ego takes a hit" So the trip was starting on the right foot.